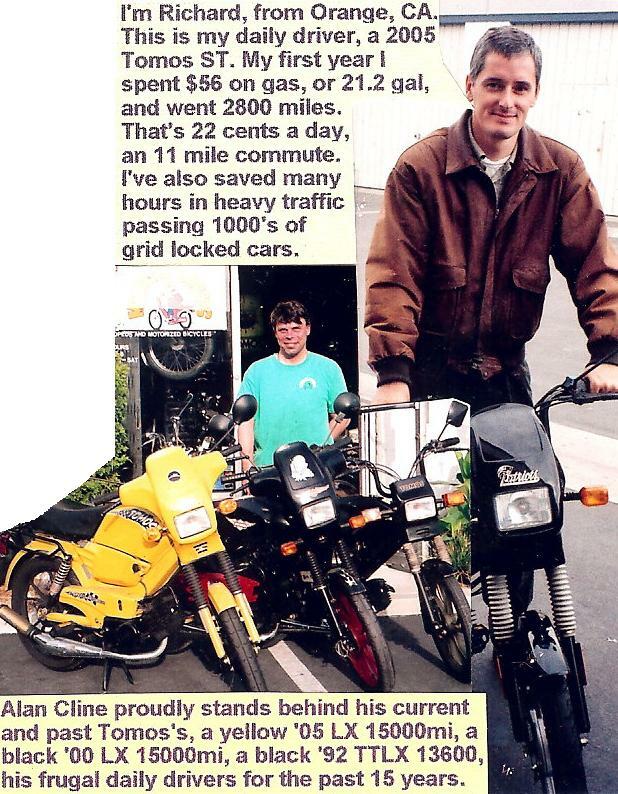 A new Tomos moped is extremely efficient. Gas mileage is over 100 miles per gallon, twice that of the most efficient automobile, and twice as much as a large motorcycle. They get 100 mpg when driven in city at full throttle all the time. When they are on the highway at 3/4 throttle they get 130-150mpg. 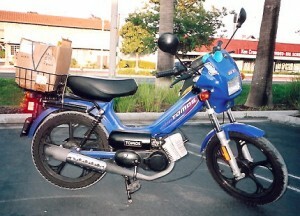 On Feb 1 2007 Shaun bought a new Tomos ST (A55 engine) blue, for his personal transportation, and carefully recorded the first 25 gasoline fill ups, until July 19. The table below shows the itemized fuel consumption of a new Tomos: 2007 miles per 19.35 gallons, equals 103.7 mpg average. 2007 miles in 175 days equals 11.5 miles per day, average. 5 to 20 miles per day is typical for moped commuting. 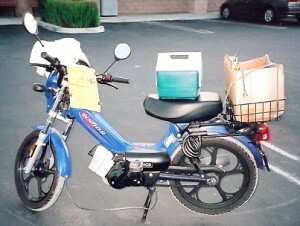 Two views of the test bike and ride leader, equipped with rear basket, ice chest, air horn, clipboard with map, and a conductive loop wire hanging low underneath for making loop detecting red lights turn green. Half a year of liability insurance on a new truck costs $400. Scheduled mainenance costs, none. Half a year of vehicle registration costs $80. Parking costs not included. The moped saves 1447.00 – 187.70 = $1259.30 every six months (2007 miles), with gas at $5.00/gal. Wow! Everyone’s operating costs are different. Calculate your own savings using this example. One customer, Todd, who often rides a 2005 Sprint (A35 engine) from Phelan, near Victorville CA, in the high desert, through the Cajon Pass, all the way to Costa Mesa, at the coast. When his exhaust was stock he would get 121 mpg, cruising at 25mph most of the time. When he changed to a Biturbo exhaust, chrome and gold shown above, his mileage went up to 143 miles per gallon, cruising slow on dirt and paved roads in the desert, where there is no stopping for traffic lights. With the performance exhaust he was able to go the same speed, 25 mph, but with only about 2/3 as much throttle. When he rides in the city, with frequent stop lights, he goes 35mph most of the time, and gets an estimated 100 mpg. From the Maintenance Chart, total maintenance for 27,000 miles is $1777 to $3087. Add in additional costs, not in chart $200+$500, for 27,000 miles is $2477 to $3787. Add to this liability insurance $120/year or $10/month. Registration $20 for life. Add “unscheduled” costs, like flat tires, mishaps, other wear and tear. Bottom line is it’s very economical. You are currently browsing the archives for the Operating Costs category.